Great place to stay. Very clean with lots of space for 2 adults and 2 little kids. Very accommodating to us after we got stranded during the storm. Will definitely stay there again! Andy’s Place was perfect – and economical – for my husband, mother, and 7-year-old daughter. Mike and Debbie seem to have thought of everything; there were indoor- and outdoor-games to play, a comfortable glider on the front porch, and a nice seating arrangement next to the grill. We enjoyed our stay very much. A Great Weekend at The Getaway! We had a great time at The Getaway property on Memorial Day weekend. The house is located close to the ferry and Division St. that will take you up to the beach at the state park. The house was clean and roomy, with fresh linens ready for us. We barbecued at night and were out at the beach most of the day. I would recommend the house for people who want to get away on the island, but have all the comforts of home. We love Kelley’s Island & Andy’s Place!! Andy’s Place was spotless upon arrival with a lovely flat yard for the boys to have a fun kickball game on. We felt right at home! Our grill was supplied with propane, the closet was full of games (you know there will be atleast 1 rainy day),there was plenty of information/books regarding what to do on the island. The owners were on the island when we got there and we met them – they provided incredible customer service and we would def. recommend this property to our friends. Super nice owners! We were there for a full week and had family at the state park. 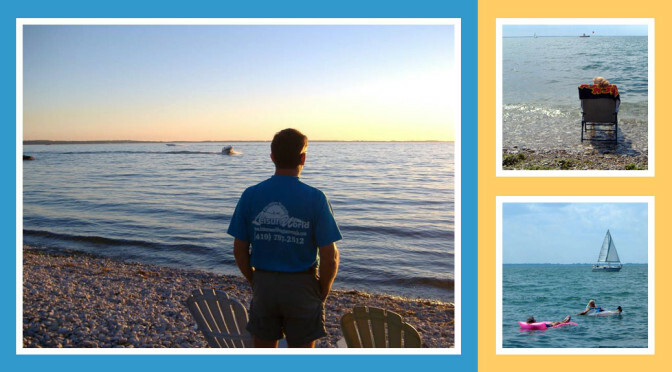 While on the island, we enjoyed hiking, fishing at the old rock quarry, rented a golf cart, enjoyed the winery, went to Put-in-Bay, shopped in town while the kids enjoyed putt putt and ice-cream – just to name a few things! Our favorite was hanging out on the beach and in the water at the State Park! Also, when you are hungry the bar, in town, behind Putt Putt has the best wings ever!!! Grilled wings! YUM!!! DELISH!!! We hope to be back next summer!!! FUN TIMES!!!! Thank you Andy’s Place for helping to make our stay such a memorable one!!! We arrived at Andy’s Place on a friday and right away were amazed by how clean and airy the place was. It had everything you can imagine and we even brought our own stuff thinking it wouldnt be there and it was. This was a quiet place to just relax and have a weekend away from the city life. We all brought our bikes which was our means of transportation. If we didnt have those, a golf cart would have needed to be rented as it is a bit far to walk into town. We had a car but just left it parked all weekend. We grilled out most of the weekend and the kitchen had all the ammenities needed. Great place for 4 people in their 30s to come and relax. Andy’s place was more than expected. For a 2 bedroom, lots of space. Although a bit away from the lake, it was an easy walk to get there. The property was secluded, very quiet and surrounded by woods. A feature this house had that many in the area did not was a covered outdoor porch area. Additionally, Michael and Debbie at Leisure World were very professional and accommodating. We only remembered we required a Pack N’ Play for our 20 month old when we checked in and they went to extra lengths to get one shipped over from the mainland the same day. I would definitely recommend Andy’s Place to any of our friends and we will seriously consider going back next year. The house was wonderful, the area was quiet (just what we were looking for) and the area restaurants were fun. The Village Pump had an excellent ‘lobster feast’ and the West End Bar had good music and good prices on the cocktails. The only thing that disappointed us was the request to do lanudry, sweep the floors, and dust. If I wanted to do that, I could of stayed at home. We will visit this area again and request this property. We were the first guests here! Enjoy yourselves at Cedar Point. Have Fun! We were the 2nd! The Wilson’s of Athens, Ohio, the Wallings from Hilliard, OH, the Gronatas from Toledo. In Lakeshore were our relatives the Bakers and Downes of Petersburg, MI. and the Bakers of Midland, MI. We had a ball! Enjoyed the park and fishing at the peir. The cottages were very nice and well supplied. Having the 1st floor handicapped accessible was a big plus for my sister-in-law who has to use a wheelchair on occassion. Neighbors were very friendly. Have a great time and Enjoy! We did. We visited South Bass Island and Marblehead today. Although it was overcast at noon and looked like rain it turned out to be a great day at Put in Bay. Looking forward to more fun at Cedar Point on Friday. I have been visiting Cedar Point since the mid 70’s. It just keeps getting better and is a fantastic place to bring our kids. Have fun Everyone! Awesome location and great house! Great reunion spot. Cleanest house we’ve ever stayed in. Love the shirt and welcome package. Beautiful House, wonderful people, great time! Thank you LW! ~Steven & Kimberley Sullivan, Ft. Smith, AZ. We just got back from the beach. As we were driving back I was thinking how lovely Kelleys Island is. It’s so peaceful and relaxing. The people here are also very nice…Andy’s Place was well thought out–includes everything anyone could need. We enjoyed the beach, the porch, game time…Everything was well thought out and planned for adults as well as my 3 children. My name is Jack Mathews, and I stayed at Lakeshore July 11-13. This is the first opportunity I’ve had to tell you what a wonderful time we had there! Everybody loved the beautiful house, park, and picturesque shore line. The amenities were great. You guys thought of everything. We felt right at home. Plus, the location is perfect for Cedar Point. Leaving the park that Thursday night, it was dark and we were more worn out than a Jerry Garcia t-shirt. Fortunately, the signs led us right down Cleveland Rd. to Rye Beach. Oh my God, we almost stayed at a motel! (lol) It was also a great place for my nephew and his wife to get their first good look at the lake. What a beautiful spot! We will definitely be coming back! This is a wonderful place to bring friends and family. Thanks again, and we’ll see you soon. Andy’s Place is so peaceful. Although we were only 20 minutes from the hustle and bustle of home, it felt like we were a million miles away. It really is an island away from all the cares of the mainland.